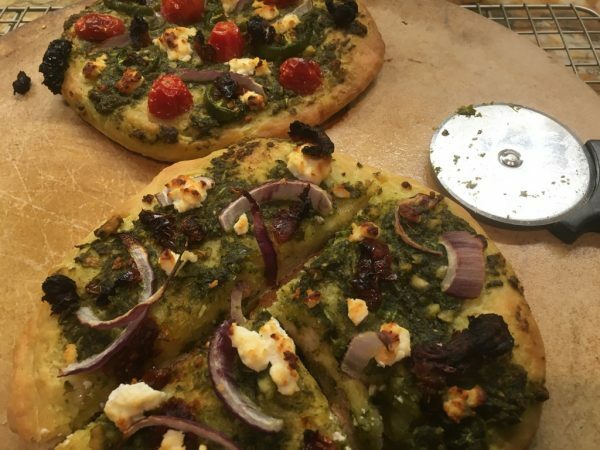 Who doesn't enjoy freshly baked, hot off the oven, homemade pizza! This recipe makes 2 medium size pizzas. We decided to make 4 personal pizzas because it's more fun! I used to make pizza more often, almost once a week when the kids were little. It was a fun thing to do with the kids. Pop the pizza in the oven, and settle with a great movie - weekends were great for this. Now that the kids were home for the long weekend, we decided to recreate the fun. 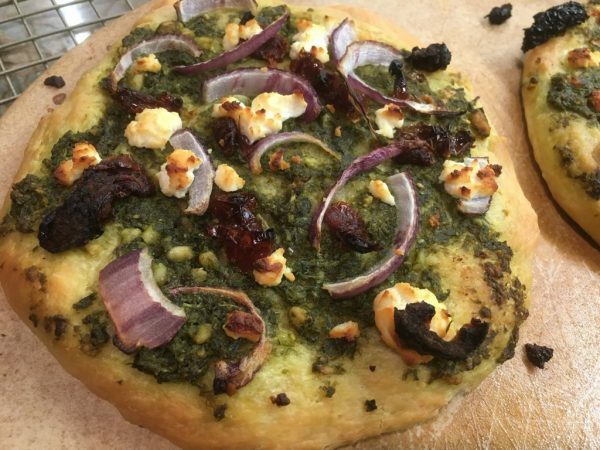 We all love homemade pesto, so pesto pizza it was! 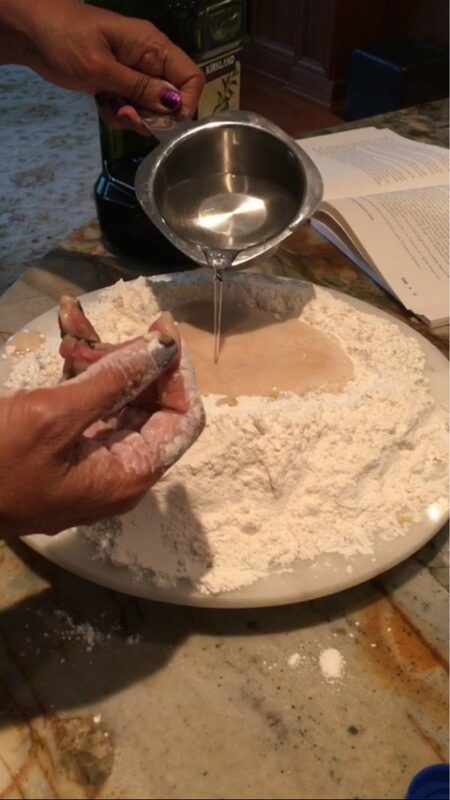 Choose a surface to work freely and dump the 3 1/4 cups of flour; I used to always make the dough in a deep, wide bowl, but learned to do this in Florence, and wanted to try it. I must admit, it was messy. But it allowed me to work more comfortably with the flour. 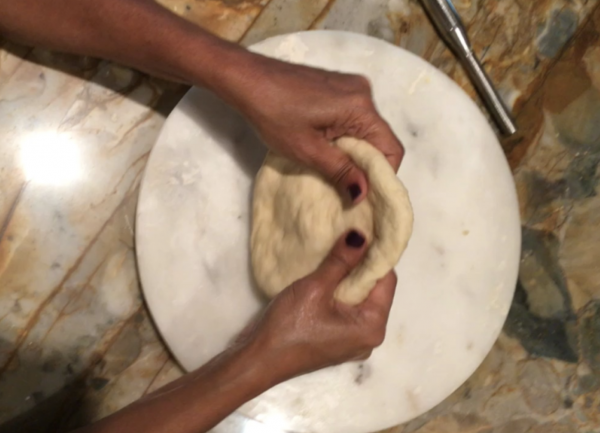 Make a well in the center of the flour, and pour the yeast mixture in it; add salt; as you can see in the video, I started this on my roti stone, and transferred it to the counter top when it became too hard to work on. 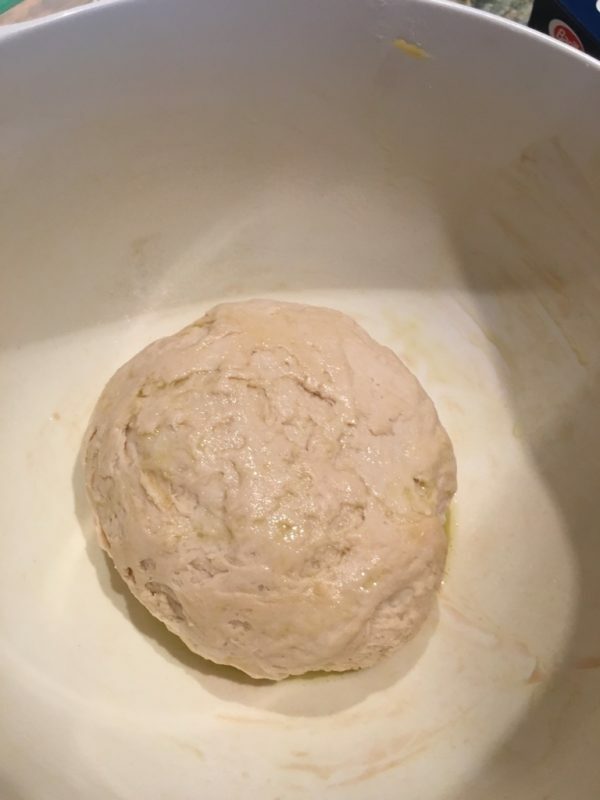 I also didn't use all the water for proofing the yeast, and used the remaining water as I made the dough. 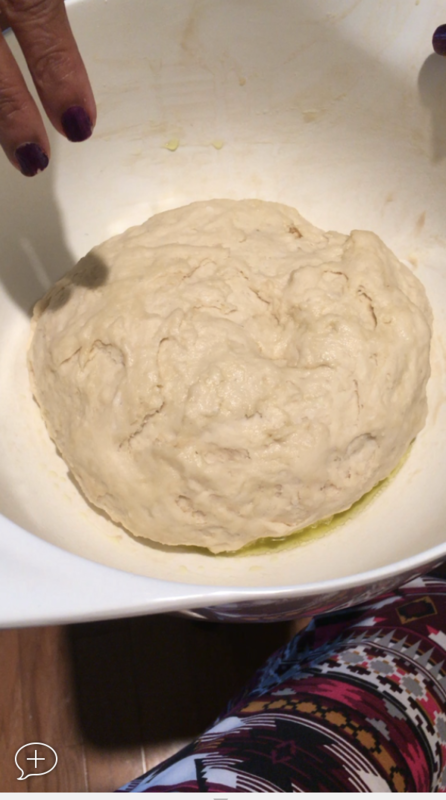 Oil a bowl and keep the dough in it in a warm place, covered with a cloth for about an hour. 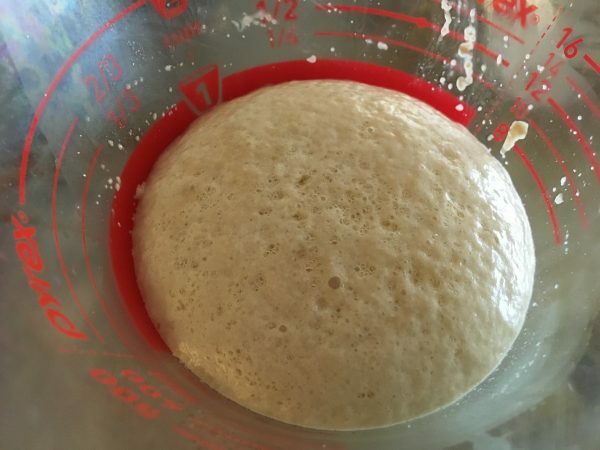 The yeast will do its magic and the dough should double in size. 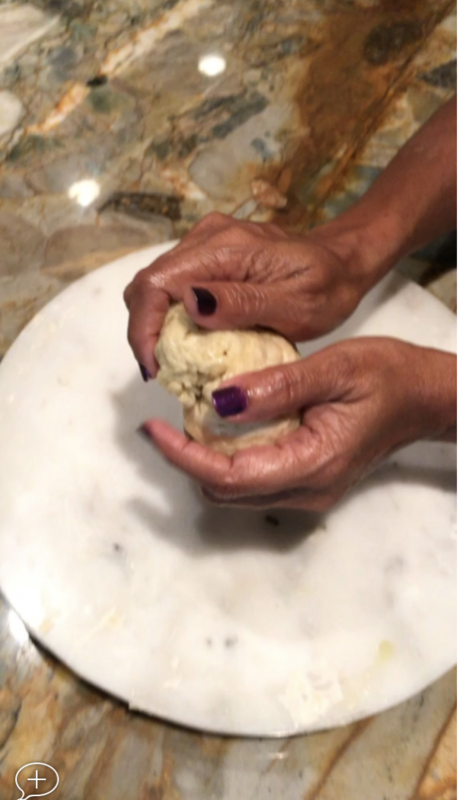 After an hour, check the dough by making an indent of about 2 inches in it with two fingers. 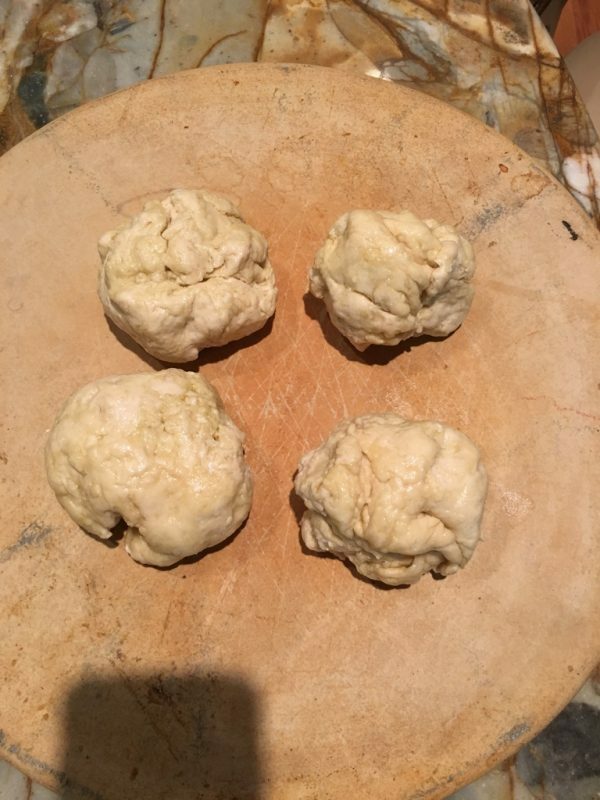 If the intent remains, your dough is doubled and ready! 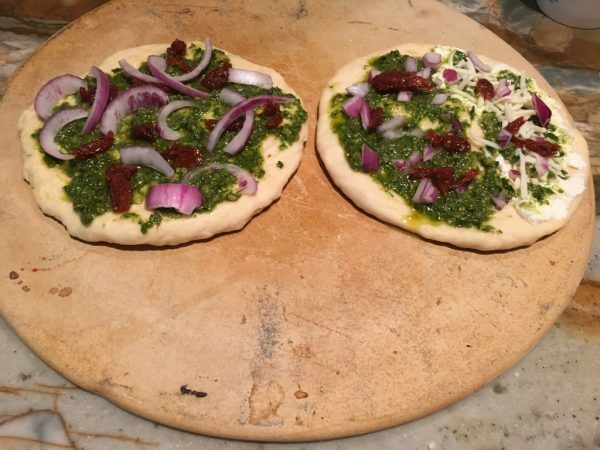 Bake in the preheated oven for about 20 minutes; definitely take it out if it starts smoking 😉 There are some schools of thought that bake the crust first for 10 minutes, then add the base and the toppings; I have always done it all together. Sometimes I might hold the cheese and add it for the last 10 minutes of the baking time so it doesn't burn. This depends on the oven mostly. Pop a movie in, get your beer/soda and enjoy hot pizza! Pizza making is an art more than a science. A lot depends on the flour, the yeast, the gluten content, and the oven's temperament. So, don't be discouraged if the pizza doesn't turn out looking like a Domino's commercial model. With practice and little tweaks, it always turns out better than any restaurant pizzas. My pizzas this time took an extra 5 minutes of baking. In the class in Florence, they used a very hot oven (I believe the temp was 700 something), and the pizzas were done in 3 minutes! Hope you have fun making pizzas with your family/kids! I used a couple of techniques I learned in making/kneading the dough, and stretching the dough for the crust, along with my tried and trusted recipe from the following book I have used for ages. (I have had/used this book since early 2000s, and it's never disappointed me).